Researchers in South Dakota have just recalibrated the The Large Underground Xenon to finally crack the code on dark matter. Dark matter has perplexed scientists for years, but researchers at the Sanford Underground Research Facility in South Dakota’s Black Hills may finally be on the verge of understanding the strange phenomenon. According to a report from UPI, the Large Underground Xenon detector has been recalibrated and could finally confirm the existence of dark matter. The Large Underground Xenon, or LUX, is the best chance scientists have for affirming that dark matter actually exists. Located one mile below the surface of the Earth, the results of a recent test published in the journal Physical Review, the detector is now more sensitive than it has ever been. 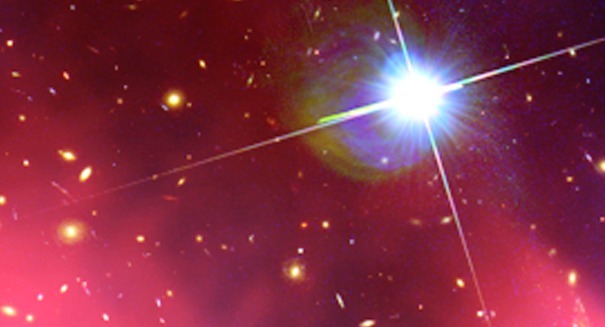 According to Rick Gaitskell, a physics professor at Brown University, the LUX is now 20 times more sensitive to low-mass dark matter particles, which will significantly increase scientists’ chances of finding a WIMP, or weakly interacting massive particle. The LUX detector consists of a massive tank filled with liquid xenon, surrounded by highly sensitive photon detectors. It has been recalibrated specifically to look for WIMPs, which scientists think are one of the likely suspects for revealing the existence of dark matter. When a WIMP collides with a xenon atom, scientists expect that the nucleus will contract and release a small flash of light. Scientists think that dark matter particles likely lost their thermal equilibrium from the highly dense plasma that made up the universe in its early days. If these particles escaped from the early universe and have continually been zooming through space ever since, researchers expect that the LUX detector will be the first to find them. According to Daniel McKinsey, a researcher working with the LUX detector from the University of California, Berkeley, the WIMPs the particle is searching for were produced in the Big Bang. He thinks the LUX detector should be able to locate WIMPs with a mass four times or higher than a proton. Researchers still have yet to observe a dark matter interaction, but the newly calibrated LUX detector represents their best chance. A press release from the University of California, Berkeley describing the details of the study can be found here.